Learning fractions as we make whole wheat tortillas. Last week I had a student ask me, “This isn’t school, why do we need to figure out these fractions?” A statement like this reminds me how incredibly important hands-on real-world learning is. Math isn’t just for school. Math is in our everyday lives. In this class we needed to half a whole wheat tortilla recipe for our Sweet Potato and Black Bean Quesadillas. The following is the recipe for the tortillas. Look below for the full recipe. Preheat a large skillet over medium-high heat. Use your hands or a well-floured rolling pin to roll a dough ball into a thin, round tortilla. Place into the hot skillet with a tiny amount of oil, and cook until bubbly and golden; flip and continue cooking until golden on the other side. Place the cooked tortilla under some towels to keep warm. This kind of math gets tricky when we don’t have a 3/4 cup measuring cup, but even more tricky when we need to half that and then find out what cups we have that will make up half of a 3/4 cup. Do you know the answer? How is your math? This is some hard math for 5th and 7th graders and even adults, but it’s not just a text book question. We needed to do this math to actually finish the recipe. 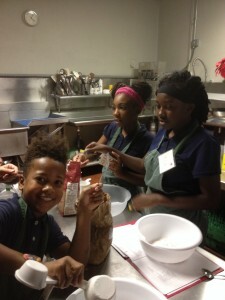 Programs like this culinary/garden club are fun, educational and healthy all at the same time! We really need to look at our education system and see how we can incorporate hands-on and real world math problems where we teach math but also the much needed life-skills such as cooking at the same time. This recipe uses all of the 5 food groups! In a medium saucepan, combine vinegar, sugar, and peppercorns; bring to a boil and stir to dissolve sugar. Place onion slices in a medium heatproof bowl; pour hot vinegar mixture over onion and let stand 10 minutes. Drain onion slices and transfer to a plate to cool. Preheat a large skillet over medium-high heat. Use your hands or a well-floured rolling pin to roll a dough ball into a thin, round tortilla. Place into the hot skillet with a tiny amount of oil, and cook until bubbly and golden; flip and continue cooking until golden on the other side. Place the cooked tortilla under towels to keep warm. Place sweet potatoes into a large pot and cover with water; bring to a boil. Reduce heat to medium-low and simmer until very tender, about 15 minutes. Drain and transfer to a bowl. Mash sweet potatoes and mix in cilantro, chili powder, cumin and salt. Cut corn off of the cob. Spread 1/4 cup sweet potato mixture onto 1 tortilla; cover with 1/4 cup black beans and 1 tablespoon corn. Sprinkle 1/4 cup Cheddar cheese atop corn; cover with a tortilla. Repeat with remaining tortillas and fillings. Put a small amount of oil in a pan and place over medium heat; cook 1 quesadilla in the hot pan until cheese is melted and beans are heated through, 3 to 4 minutes per side. Repeat with remaining quesadillas; slice into quarters. Top with desired ingredients.